My new Pluralsight course was just published which shows how to use the open source Polly library. Polly is a great library by Michael Wolfenden for configuring the automatic retrying of operations if exceptions occur. Transient errors such as the network being slow/unavailable for a small amount of time can normally result in errors surfacing to the user and/or into log files that need looking at. By using one of the exception handling strategies that Polly provides, these transient exceptions can automatically be retried, preventing user errors and/or log entries. Check out the Polly GitHub repo, the NuGet package or the “Better User Experiences and More Robust Applications with Polly” Pluralsight course. Shouldly is an open source library that aims to improve the assert phase of tests; it does this in two ways. The first is offering a more “fluent like” syntax that for the most part leverages extension methods and obviates the need to keep remembering which parameter is the expected or actual as with regular Assert.Xxxx(1,2) methods. The second benefit manifests itself when tests fail; Shouldly outputs more readable, easily digestible test failure messages. In each of the preceding failure messages, there is not much helpful context in the failure message. Notice the additional context in these failure messages. In each case here, Shouldly is telling us the name of the variable in the test code (“schedule”) and the name of the property/field being asserted (e.g. “Total Hours”). In these examples there is no mistaking an actual value parameter for an expected value parameter and the test code reads more “fluently” as well. To find out more about Shouldly check out the project on GitHub, install via NuGet, or checkout my Better Unit Test Assertions with Shouldly Pluralsight course. 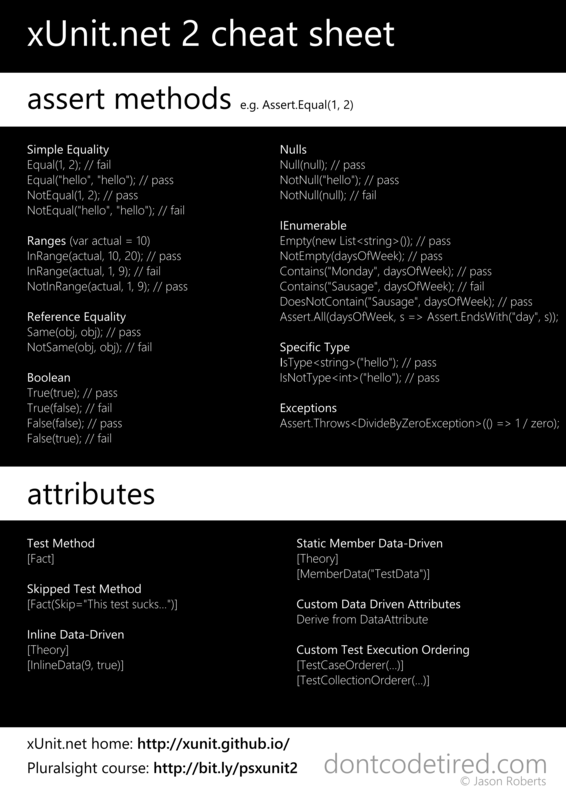 To compliment the release of my Testing .NET Code with xUnit.net 2 Pluralsight course, I’ve updated my original xUnit.net cheat sheet. 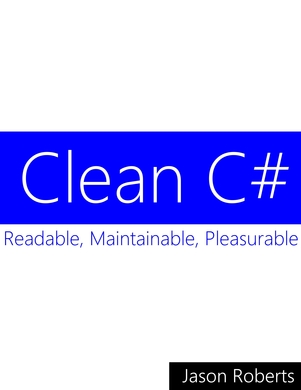 The final version of my free Clean C# eBook has just been published. My new free Syncfusion eBook is now available. LINQ Succinctly is available from the Syncfusion site along with all the other eBooks in the Succinctly series. Fixie is a relative newcomer to the .NET testing framework space. It throws away the idea of marking elements of test code with attributes in favour of a conventions based approach. At a high level, what this means is simply naming things in test projects following a defined default (customized conventions are also supported) convention. A Fixie test class with a single test inside it would look like the following, notice the lack of attributes and even using statements. After building the test will now show up in Visual Studio Test Explorer as the following screenshot shows. Fixie knows this is a test because it matches the default conventions that come out of the box. Fixie knows that this is a test class because it ends with “Tests” and it knows that the method is a test because it’s a public void method. If these default conventions are not suitable for your project you can create your own custom conventions to customise the test discovery. There’s also a lot more to custom conventions, such as customising the test execution lifecycle and creating data-driven tests. To learn more about Fixie, check out the docs or my Introduction to Fixie Pluralsight course. If you are just dipping your toe in the water when it comes to testing .NET applications it can be a bit confusing. In addition to learning how and what to write test, you also have to learn a testing framework such as MSTest, xUnit.net, NUnit, etc. My new beginner Pluralsight course helps you to get started with testing in .NET and how to use the NUnit testing framework. Watch the course at the above link or get to it from my Pluralsight author page.